Today, LivingSocial is announcing Room Service, which delivers high-end meals to your door — complete with dishes, candles and cloth napkins. The Washington, D.C.-based company will also be trying out a poorer-man’s option, called Instant Ordering, that offers takeout and delivery from a wider selection of restaurants. Both services will be offered at full price, breaking the company’s tradition of offering deep discounts to restaurants, spas and other experiences. Initially, the services will be available in LivingSocial’s hometown as the kinks get worked out of the system, but the company has ambitions to take it wider. The Instant Ordering service will leverage restaurants that already have existing delivery or takeout options, but Room Service will be for restaurants that have never tried it before. LivingSocial will provide the vans and the delivery personnel, and will drop off the food at a designated time. It will also pick up the plates the next day. It sounds a little bit like Kosmo, the venture-capital-backed free delivery service that exploded during the dotcom boom, but Room Service is working with high-end restaurants, which probably have larger margins to play with than a movie rental or a pack of cigarettes. We hear there’s chocolate for dessert, too. Just not on your pillow. Starting on Tuesday, 70 merchants will be participating in the company’s Instant Ordering service; Room Service will kick off on Thursday and Friday with just one. The service’s guinea pig is D.C.-based Kushi, a sushi restaurant co-owned by Ari Kushimoto Norris. 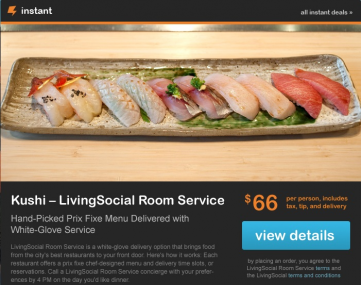 Kushi will offer two set menus for $66 each. The first offers several small plates, including shrimp and pork skewers, with a plate of sushi. The second offers vegetarian small-plate options, such as mushrooms and soba noodles with a plate of sushi. Kushimoto said the price compares to a meal at the restaurant, with tip included. An undisclosed portion of the revenue will go to LivingSocial. O’Shaughnessy explained that the value of Room Service is not in the discount that the company is typically known for giving, but in the convenience and experience of the service. Kushimoto said she believes it will be an attractive service for working families that don’t have a babysitter, but have the capacity to spend money on a regular basis in restaurants. One of the challenges she dealt with in early trials involved retaining the quality of the food — in other words, keeping the warm plates hot and the cold plates chilled. But delivery is something Kushimoto has always wanted to try. Since LivingSocial is hiring the delivery drivers and promoting the service, she doesn’t have to worry about taking on the risk of hiring extra personnel before it takes off. Both new services will be part of the company’s “Instant” offering, which include being able to buy a discount via a mobile phone and redeem it in a matter of minutes. Instant is currently live in 22 metropolitan areas. So far, the variety of merchants offering deals in any particular neighborhood can be low, but by offering a list of options, where you can get take-out or delivery, the catalog will grow, albeit at full price. Of course, merchants will have the option of offering a discount, and users will be able to redeem prior offers.